It's hard to believe the world's largest 55+ community could get even bigger, but plans for The Villages do just that. With around 65,000 homes and 125,000 residents, it’s easy to imagine The Villages has taken up all of the Florida real estate it possibly can. But, plans have been submitted to Wildwood’s Planning and Zoning Board to develop an additional 1,620 acres, which would effectively double the size of Florida’s largest and most unique 55+ community. Plans were submitted by The Villages Land Co., and they were approved by a special magistrate at the Planning and Zoning board meeting earlier in March. The city commission will consider them at the end of this month. The land expected to be developed is in the Villages of Southern Oaks. The largest swath of land in this proposal is nearly 1,000 acres between Lake Okahumpka and the Florida Turnpike, where State Road 44 nearly runs into County Road 468. That area would be divided by Meggison Road, where golf cart paths would run parallel to the road. In addition to creating space for at least six new neighborhoods, that land would also support the construction of a golf course, a golf pitch-and-putt area, and a recreation center. Developers envision a golf cart bridge running across the turnpike and will develop the commercial lots at each end of the property between SR 44 and CR 468. Two other areas would complete the expansion. The 471 acres south of the turnpike along U.S. 301 is currently made up of wetlands and water retention basins. The area west of the VIllage on Fenney has recently been acquired and is within the city of Coleman. These areas will be turned into residential and recreational areas, and the community would have an entry gate on U.S. 301 with a pedestrian walking path. In addition to adding about 50,000 new homes, this land would also include about 11.2 square feet of space for non-residential use. There would be commercial, office, and governmental space, including a utilities maintenance facility. Plenty of new and resale homes are currently available at The Villages, an expansive active adult community spanning three Central Florida counties and over 20,000 acres of land. Buyers can find single-family homes, attached villas, and manufactured homes available in prices that start below $100,000 and go up to over a million dollars. The community has been called Florida’s Friendliest Hometown, and it attracts residents from all over the country. 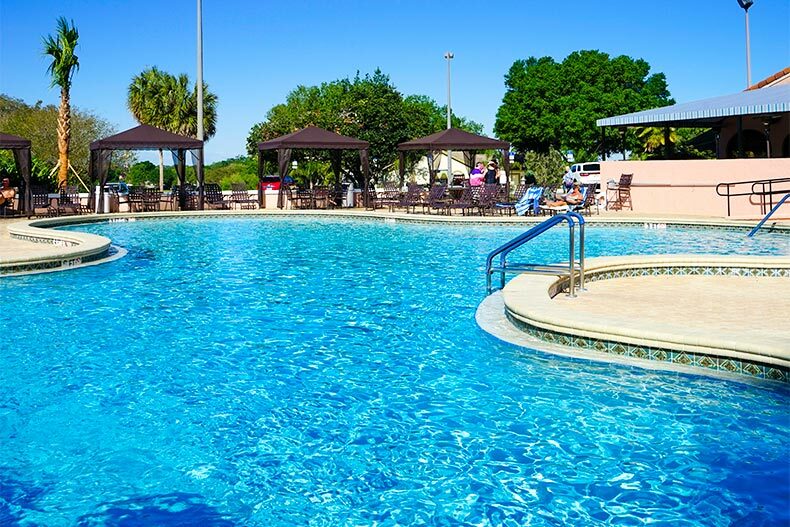 Homeowners in The Villages have their pick of pools, golf courses, fitness centers, and sport courts. Three town squares provide central gathering areas for the active adults living in this widespread community. At Spanish Springs Town Square there’s free entertainment just about every night. There’s also a hotel, restaurants, and shops. Locals love the residents-only opera house called Katie Belle’s and The Rialto Theater where it’s easy to catch a movie. Lake Sumter Landing Market Square is a lakeside space with shops, restaurants, and a lighthouse. Brownwood Paddock Square is the newest gathering space, designed to resemble a Florida cattle town. In addition to amenities such as dozens of pools, fitness centers, and space for softball, shuffleboard, tennis, pickleball, and bocce, residents have access to everything they want. There’s no need to leave The Villages for medical care, groceries, banks, or places of worship. One of the best perks for residents is free golf at any of the 36 executive courses and 12 country club courses within The Villages. 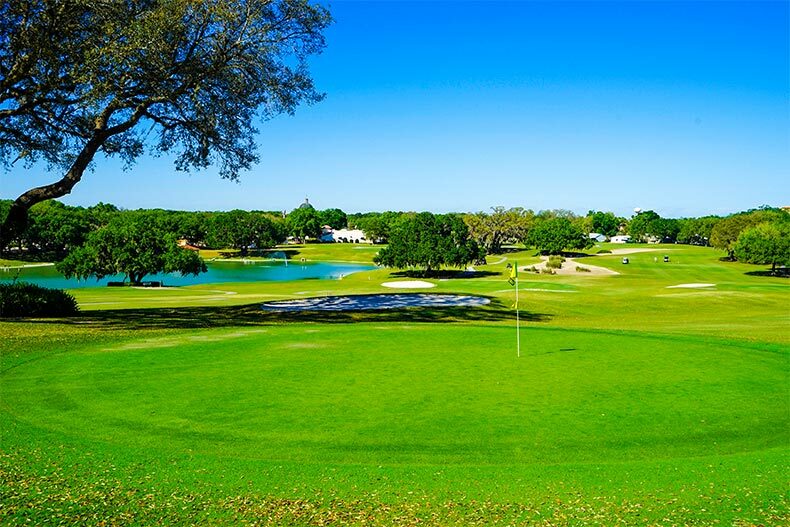 It’s unlikely that golfers would get bored with such a large number of places to play, but if they do, there are also 10 championship courses in the area, including Palmer Legends and the Nancy Lopez Legacy Country Club. At these courses, residents of The Village get a free membership, and pay discounted fees while getting preferred tee times. Residents who have never played golf but have an interest in learning can take classes or private lessons at The Villages Golf Academy. Instruction, golf club fittings, a pro shop, and a driving range are all available. A lot of interesting things are happening at The Villages. From the introduction of autonomous cars to a new retail center opening in Lady Lake later this year and the potential for the community to double in size, current and potential residents can look forward to new opportunities and growing neighborhoods.